Traditional bierock filling is hamburger, cabbage (or well-drained sauerkraut), onions, salt and pepper. The addition of garlic or–gasp–cheddar cheese makes them all the more delicious (in my opinion) and is not uncommon. I also add turmeric for depth, marjoram for brightness and a hit of cayenne for fun. The dough recipe is also flexible. I like to substitute in a cup of light rye flour, which plays nicely off the cabbage. Others sub in a cup or two of whole wheat flour. For the dough: If you are using rapid-rise yeast, heat the water to 105-110 degrees in a small bowl. Stir in yeast to dissolve and set aside to proof. If eggs are cold, warm them in a bowl of warm water before cracking and beating. On the stove or in the microwave, heat milk, sugar, salt and butter until butter has melted. Stir to dissolve sugar and salt and to cool slightly (to about 105 degrees). Pour milk mixture into the bowl of a stand mixer. If using instant yeast, stir yeast into the rye flour. (Omit the water.) With the paddle attachment, beat the rye flour and 1 cup of all-purpose flour into the milk mixture. (If using rapid-rise yeast, beat the proofed yeast into the milk mixture before adding the flour.) Add eggs. Beat until smooth. Gradually beat in 2 1/2 cups of flour, forming a shaggy dough. With a dough hook and adding the remaining flour as necessary (you will need most of it), knead the dough until it forms a soft ball that cleans the sides of the bowl. (Or knead on a lightly floured surface.) The dough is ready when you can pinch off a small piece and stretch it thin without breaking the dough. Place in greased bowl, turn to cover the dough surface with oil. Place seam side down and cover with a towel. Let rise for 45 minutes to 1 hour, or until doubled in bulk. While bread is rising, make the filling. In a large skillet, brown the beef. Season with salt, pepper, turmeric, marjoram and cayenne. Cook over medium heat, breaking up the beef into very small pieces with a wooden spoon. Once browned, remove the meat from the pan, pat with a paper towel and cool. In the same skillet, with about two tablespoons of meat grease plus 2-3 tablespoons of butter, saute the onion and garlic until softened, about 3 minutes. Add the cabbage. Season with salt and pepper. Cover and cook until the cabbage is tender. Cool slightly. In a large bowl, stir meat and cabbage mixture together. Add the cheese and stir until well blended. Set aside. Punch down the dough. Pinch off small balls (3 ounce each for larger rolls, 1 1/2 to 2 ounces each for party size). 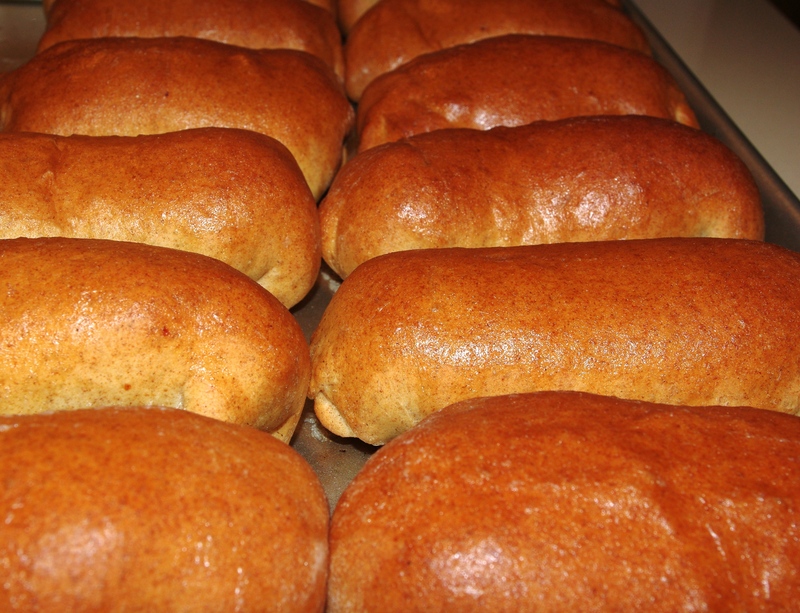 Roll dough into oblongs and fill each with 1/3 cup of filling (about 1/4 cup for small rolls). Do not over fill or the roll will leak or the dough break. Fold sides over and tuck in ends to form a rectangle. Pinch edges to seal. Place, seam side down, on a greased cookie sheet, leaving a little space between the rolls. Let rise for about 30 minutes. Preheat oven to 375 degrees. Bake for 20-25 minutes, or until browned. Remove from oven and brush tops with butter. Serve warm with horseradish sauce (made by stirring prepared horseradish into mayonnaise or Miracle Whip). Makes about 1 dozen large rolls or about 2 dozen small rolls. NOTE: These freeze well and can be reheated in the oven or for about 45 seconds in the microwave.